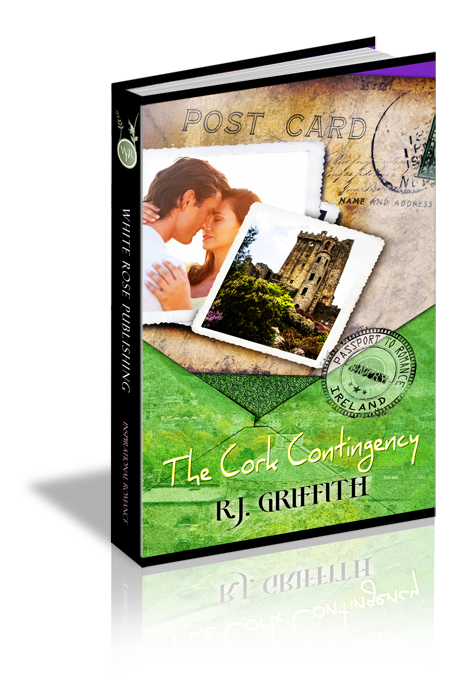 In her normal routine as a home health Registered Nurse, Margaret Smith is ambushed by her overly concerned sister and sent on a non-refundable trip to County Cork, Ireland. Her scheduled life is turned upside down when she arrives and can't find her way around town, let alone to the destinations on her itinerary. A handsome tour guide comes to the rescue...But can he be trusted? The security line stretched through the airport like a python basking in the sun. Margaret rubbed her thumb against the plastic handle of her carry-on bag and shifted her weight to the opposite foot. Several airport security guards rushed by speaking into the radios strapped to their shoulders. A black and tan German shepherd wove through the sea of people, its nose twitching. The man grasping the leash reminded Margaret of a professional boxer. She stopped massaging her calf muscle, stood tall, and hoped the yogurt-covered pretzels in her carry-on wouldn’t draw the dog’s attention. Why did I let Janet talk me into this? What kind of person agrees to an international vacation with just twenty-four hour’s notice? The hulking man and his dog sauntered past. The dog sniffed the air, still searching for a scent. Margaret unzipped the front pocket of her carry-on and pulled out her travel information and passport. A neon pink sticky note clung to the top page. Hi sis! Here are the tickets and info. Sorry the passport photo is dated. It’s the only one I could find at Dad’s house. Have a great time! Margaret cracked open the booklet and cringed. The girl with dark brown curls springing from her scalp in all directions wearing scrubs couldn’t be her. When was this picture taken? The last time I wore dark blue scrubs, I worked at the city hospital. Margaret touched the tight bun on top of her head. Four years and several tubs of hair gel later, she could tame it again. Come to think of it, Janet talked me into that horrible haircut, too. Margaret snapped her passport closed and shuffled through the brochures in the packet. “Blarney Castle, Charles Fort, Blarney B and B…what is this?” The words Gatorland, Florida scrawled across a picture of a mega croc leaping out of swamp water, jaws closed around a chicken. She imagined her sister grabbing a handful of brochures from the travel agent and stuffing them into the packet. Margaret pulled out her boarding pass and double-checked her destination, just in case. The typed print read Cork County, Ireland. Margaret tucked her information packet back into the front of her carry-on bag and took one step forward. A lightning bolt of pain shot through the back of her leg. She looked down at the four-inch burgundy stilettos torturing her feet and groaned. Janet pinched the bridge of her nose. “It’s not a closet, it’s a shoe rack. Take the pumps, Margaret.” The heels dangled from Janet’s fingers until Margaret lifted them off. Margaret cringed as another cramp cascaded down her calf muscle. Promise or no promise, these shoes are coming off. She fumbled with the buckle across her ankle, tugged the strap loose and slipped her foot from the shoe. Margaret hurried to free her other foot, dropping the handle to her carry-on. It flopped to the floor and spilled her travel packet across the swirls of blue carpet. Not only did the security line creep like molasses, but her favorite shoes, a pair of worn, low top sneakers, boarded the plane long before she would. Margaret knelt on the floor, careful not to snag her pantyhose, and collected the papers. “Keep the lines moving, please,” said an older security guard. He stared down at Margaret until she stood and closed the three foot gap. “Please have your tickets and ID ready,” an official stated to the crowd from behind his post. He wore a sour expression on his angular face. The line moved forward allowing Margaret to read his nametag, Milo. She pulled her license from her purse. She grabbed the packet and rifled through for her passport and tickets. “That’s strange,” she said out loud, shuffling through the stack a second time. Panic inched up the base of her spine. I must have lost it when my bag tipped over. What if they arrest me? She checked behind for anyone waving a passport in the air. The line opened up and Margaret found herself shunted into Milo’s lane. “Excuse me. I need to get in that li...” her voice died as she looked up at the stony faced man behind her. “Never mind.” Margaret faced forward again and re-checked her bag. “Ma’am, I need to see your tickets and ID. Ma’am?” Milo rose from his stool and reached for his side. His bushy eyebrows tangled together as he furrowed his brow at Margaret. Is he reaching for a gun? She panicked and thrust the tickets onto his counter. “I’m having trouble finding my passport,” Margaret said. She bent again to rummage through the front of her carry-on. “Ma’am, I need some ID or you’ll have to go to the end of the line.” He bent his face to the radio and pressed the talk button. “Yes, ma’am, that will work.” Milo took the license and made several check marks on Margaret’s ticket next to her name, flight number, and date of birth. He glanced from Margaret to the license several times. “Not very photogenic, are you?” His monotone voice made it clear he wasn’t asking a question. “You can pass.” He waved his pen to the next person in line. “If you don’t find your passport, ma’am, they won’t let you into Ireland.” Milo’s expression didn’t change. “Thanks.” Margaret wondered if she had imagined his kindness. He handed her tickets and license back. Margaret whisked them into her purse, zipped it up, and walked toward the next station. Maybe God let me lose my passport because He doesn’t want me to take this trip after all. She searched her carry-on pocket again, while loading her things into the tubs for the scanner. No passport. She pushed the tub onto the rollers and started calculating how long it would take for her to flag down a taxi and make it home. Margaret calmed her excitement. No need to draw attention and be detained by security. She pictured the German shepherd from earlier tackling her. The thought of being questioned in a booth all morning made her stomach turn. “Please step into this line, ma’am.” A tall, graying man pointed at her, and then the body scanner. Margaret’s victory balloon deflated a little. Why couldn’t her sister have surprised her with a gift certificate to a spa instead? She stepped into the booth, mimicking the picture on the wall, and held her breath as the scanning arms turned around her. Security guards milled about. One spotted Margaret. He held out his metal detector wand and walked her direction. “Thank you.” Margaret returned the woman’s smile. She reclaimed her purse, shoes, and carry-on from the large white tubs. There, peeking from the edge of the zipper pocket was a little blue book—her passport. “How in the world…” She opened it up and saw a familiar face peering back at her. “This is the final boarding call...” The announcer gave out Margaret’s flight information from New York, U.S.A. to Cork, Ireland. Margaret stepped back into her heels and made a wobbly dash to the gate. Thirty-two is not old enough to be a ma’am! Margaret went down the jet bridge toward the entrance. A tall man stood in Margaret’s way. His thick, sienna hair brushed against the collar of his heather-gray sweatshirt as he spoke to the steward. He’s tall, I’m not quite eye level with him in four-inch stilettos. The man threw his head back in a loud guffaw. She stumbled over her carry-on and thumped against the wall. “Looks like you’ll have to move, Donnell. You’re holding up a passenger,” the steward said. “Excuse us, miss. I didn’t know you were waiting,” he said in a soft brogue. Margaret looked up into a kind face with stunning emerald eyes. Stop gawking Margaret! She tore her gaze away and ducked her head. Question 1: How did Margaret feel when her sister gave her a trip to Ireland? Question 2: How do you feel when God challanges you to step out of your comfort zone? Question 3: Why is it so important to Margaret that she stick to a plan? Question 4: Why is it important that we seek God's plan before we make our own? Question 5: How does having Donnell as a tour guide streatch Margaret? Question 6: Does God ever place other people in our lives to streatch our faith? Question 7: When Margaret think she sees Donnell with another girl, how does Margaret feel? Question 8: Does God use our broken moments to draw us into his arms? Question 9: When Margaret leaves for home, how have her expectations changed? Question 10: Has God ever changed your perspective on something you felt sure about?